F-14 Restoration Project DONE! Unveiling Set! 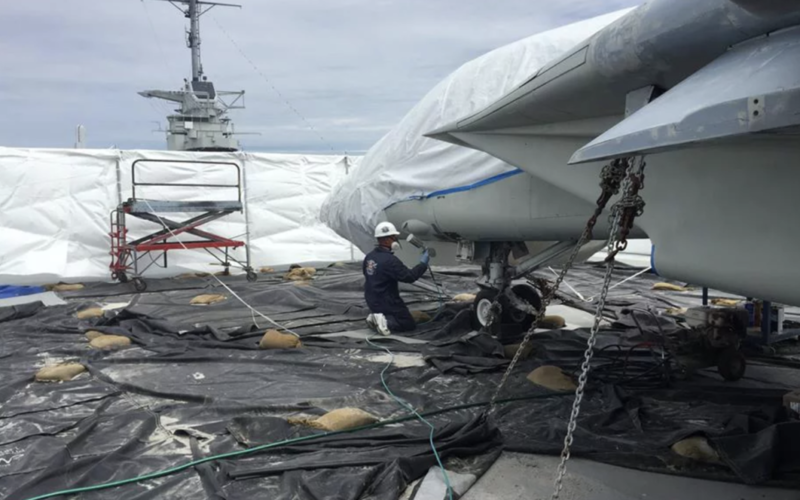 On Saturday, April 23 at 1 p.m. volunteers with the United States Navy Flight Deck Veterans Group (FDVG), will host a brief ceremony to unveil the work they’ve done to restore the F-14 Tomcat currently displayed at Patriots Point Naval & Maritime Museum. Since February, groups of FDVG volunteers have traveled to Patriots Point from across the country every weekend to work on the Tomcat. Volunteers have worked during the week as well. Their work has included sanding, patching holes, installing new lighting, paint/primer application and replacing hardware. Tools, materials and labor for the F-14 restoration project were all donated by FDVG. Volunteers with the FDVG have all served in the Navy and worked aboard aircraft carrier flight decks. The organization took on the project so that their members could have a chance to work on an aircraft they grew to love while serving in the Navy, and as a way to reconnect and share experiences with former veterans. Note: all interested participants report to the flight deck and locate one of our FDVG members. FDVG “Members” please show your FDVG membership ID card at the gate for Free admission.